WASHINGTON — It was a moment that will go down in Washington-area sports history. Gonzaga had rallied from a 20-point deficit and taken the lead with just 29 seconds left, only to fall behind again when DeMatha returned the ensuing kickoff for a touchdown to surge back in front. It was then that Gonzaga quarterback Caleb Williams’ leadership ability came to the forefront. Coach Randy Trivers says that Williams is special because of his ability to make good decisions and his physical ability. But in the biggest game of the season, Williams’ ability to remain focused was just as important. So when Gonzaga got the ball back with time for just two plays, Williams was ready. And his 53-yard Hail Mary to wide receiver John Marshall lifted the Eagles to an amazing 46-43 victory in the Washington Catholic Athletic Conference championship game on Sunday night — a game that will be remembered for years to come. Williams, a sophomore who already holds scholarship offers from many of the nation’s top programs, passed for 358 yards and three touchdowns, rushed 20 times for 113 yards and two touchdowns and caught a nine-yard touchdown pass on a trick play. 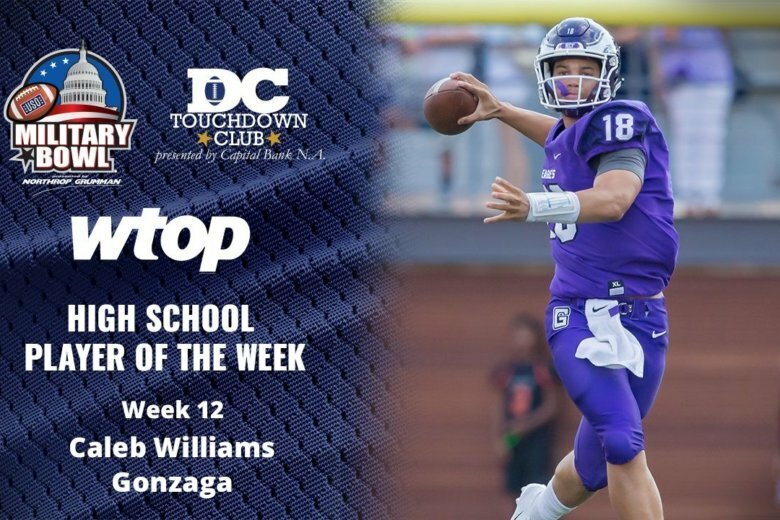 For his efforts, Williams — who also celebrated his 17th birthday on Sunday — was named the Military Bowl DC Touchdown Club High School Football Player of the Week. The win capped a sensational postseason run for Gonzaga, which beat previously undefeated St. John’s in the WCAC semifinals. Chesapeake WR-K Colton Spangler caught a touchdown pass, made three field goals and all three of his point-after kicks as the Cougars beat J.M. Bennett, 36-21, in the Maryland 3A East Region final. Bell QB Ronnell St. John threw three touchdown passes as the Griffins won their first-ever DCIAA Gravy Bowl, 47-0 over McKinley Tech. Linganore WR-LB Joey Felton caught five passes for 91 yards and a touchdown and forced three fumbles on defense as the Lancers beat Westminster, 52-20, in the Maryland 3A West Region final. Broad Run QB Mitch Griffis rushed for two touchdowns and passed for two more as the Spartans beat Tuscarora, 28-14, in a Virginia 5A Region C semifinal. Westfield QB Noah Kim completed 14 of 16 passes for 157 yards and three touchdowns as the Bulldogs beat South Lakes, 35-7, in a Virginia 6A North Region D semifinal. Quince Orchard RB Marquez Cooper rushed 23 times for 104 yards and a touchdown as the Cougars beat Northwest, 35-0, in the Maryland 4A West Region final. Freedom-Woodbridge RB TyQuan Brown rushed 44 times for 277 yards and one touchdown as the Eagles beat Hayfield, 29-19, in a Virginia 6A Region C semifinal. Flint Hill RB Jordan Houston, a Maryland recruit, rushed for 105 yards and a touchdown as the Huskies won their 22nd consecutive game, 36-14 over Benedictine, to claim their second consecutive VISAA Division I title. North Point WR-DB Malik Lawrence caught a touchdown pass, rushed for a touchdown and caught his 14th interception of the season on defense as the Eagles beat South River, 46-7, in the Maryland 4A East Region final.